Eric van der Horst maakt een geweldige Engelstalige fietsgids voor Nederland. Voor al uw vrienden, verre familie of kennissen die van verre eens Nederland komen bezoeken. Hoe beter te ontdekken dan op de fiets. En hoe beter dan met deze fietsgids. It took Cycling Dutchman Eric van der Horst over 15 years to explore the full extent of the Dutch cycle route network. In this guidebook he presents his very best routes and a unique insider look into a true cycling nation, packed with invaluable practical information. All routes in this guidebook give you something extra. It guides you along those special landmarks, places of interest, the best countryside and last but not least the finest rides of the country. To make navigating easy the book features a 340 kms circular route in central Netherlands, where you find a multitude of landscapes with plenty of possibilities for sightseeing. You can start this route from all main Dutch ferry ports, Amsterdam Central Station and many other Dutch railway stations. 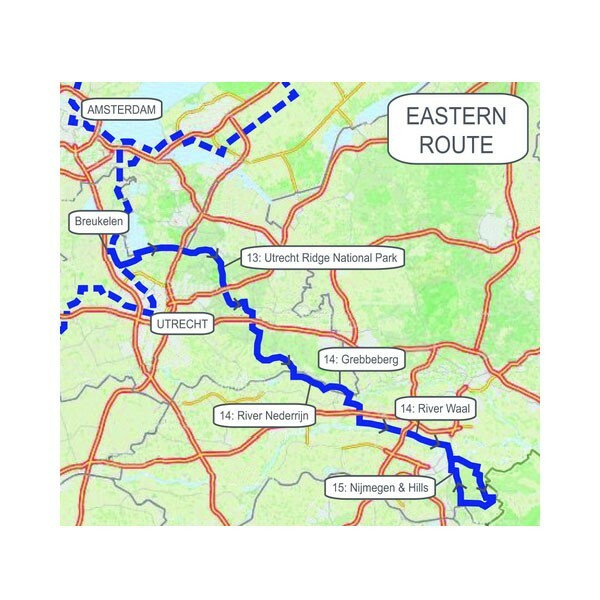 This circular route could take up to 14 days to complete when cycling at an extremely easy pace. Keep in mind though that The Netherlands is very flat, so when cycling 3 to 4 hours per day most people should be able to cover this route in a week or so. For those who want more, there are three additional one-way routes stretching north, east and south into the country. All these routes have their own particular character, different from the main route. To rejoin the main circular route or to skip route sections, you just hop on the train. The guide also offers a circular route in Amsterdam and a tulip fields route. A main feature of the circular route is the excellent tarmac cycling highway through the sand dune reserves of the Dutch coast, providing continuous direct access to Holland’s sandy beaches. It is worth spending a night in The Hague. This city is not only home to some world class museums, but also to Madurodam, a miniature city with all the well known buildings of The Netherlands on a 1:25 scale. Beyond The Hague you can visit the Tiki pool, Europe’s largest covered waterslide paradise. The seaside towns of Katwijk, Noordwijk and Zandvoort with their great beaches offer more swimming options. If you visit during April or May you should do the route through Holland's bulb fields; don’t miss out on the famous Keukenhof Gardens!